About Time vol. 2 covers Seasons 4 to 6 of "Doctor Who," focusing on the very end of the William Hartnell era and the whole of the Patrick Troughton era of "Doctor Who" in mind-bending detail. In addition to the usual concerns such as the TV show’s continuity (alien races, the Doctor’s abilities, etc.) and lore (anecdotal, "Did You Know? "-style material), authors Lawrence Miles and Tat Wood will examine each Troughton story in the context of the year/historical period it was produced, determining just how topical the stories were. 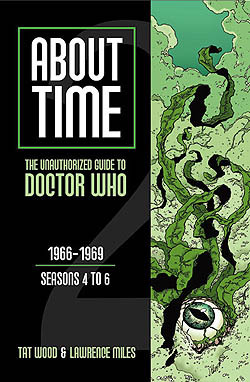 Essays in this volume include: "What Are the Dodgiest Accents in the Series? ", "What's the Cyberman Timeline? ", "What Do Daleks Eat? ", "Why Was a McCrimmon Fighting for the Pretender? ", "How Many Atlantises Are There? ", "Whatever Happened to the USA? ", "How Do They Do Those Titles? ", "How Do You Set a Trap For Someone Who Doesn't Know Where He's Going? ", "Why is That Portrait in Maxtible's Parlour? ", "Did Sergeant Pepper Know the Doctor? ", "How Buddhist is This Series? ", "Cultural Primer: Why the Radio Times? ", "What's the Timeline of the Twenty-First Century? ", "Is the Yeti-in-a-Loo Theory the Worst Idea Ever? ", "Does the TARDIS Fly? ", "What Planet Was David Whitaker On? ", "When Did the Doctor Get His Second Heart? ", "Who Was the Master of the Land of Fiction? ", "Whatever Happened to Planet 14? ", "Does Plot Matter? ", "Is Doctor Who Camp?" "Was There Any Hanky-Panky in the TARDIS?" and "Did Doctor Who End in 1969?"